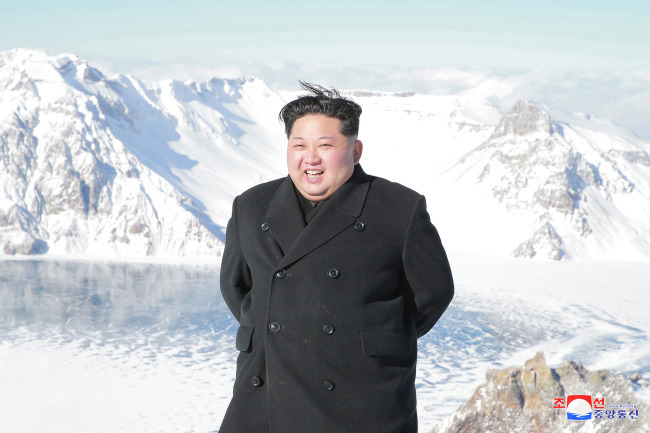 Why did Kim Jong-un climb North Korea’s sacred mountain? Since taking power in 2012, North Korean leader Kim Jong-un has climbed the mountain Baekdusan almost every year and often made important announcements after visiting what is considered the most sacred place in the reclusive regime. For instance, his decision to execute his uncle Jang Song-thaek in December 2013 was revealed about a month after his trip to the mountain and the nearby area. Following a 2014 trip, Kim announced he was willing to resume suspended inter-Korean talks. So now comes the guessing at what sort of message Kim is to deliver after his 2017 visit, believed to have taken place after the South Korea and US militaries conducted the largest-ever aerial combat drill from Dec. 4 through Friday. “Our great leader (Kim Jong-un) paid a visit to Baekdusan after accomplishing ‘great success’ in November,” the state-run Korean Central News Agency said Saturday, referring to what they saw as the successful launch of the Hwasong-15 intercontinental ballistic missile. According to the statement and photos released by the KCNA, Kim, standing behind the crater lake at the mountain, recalled the “emotion-charged” days when he realized the country’s success of completing its claimed “nuclear force.” The KCNA did not reveal the specific date of the trip. Experts said the visit could have given him the opportunity to clear his mind before laying out his national vision for 2018, as North Korea is seeking to become a full-fledged nuclear state and achieve the goal of mastering nuclear-strike capability. And such messages would be incorporated into Kim’s address on New Year’s Day, experts added. In his 2017 New Year’s address, Kim said the North was “in the final phase” of conducting its first intercontinental ballistic missile test. “Ascending to the top of Baekdusan, Kim Jong-un is thought to have reported to his predecessors about North Korea’s nuclear progress and made the commitment to his endeavor,” commented Yang Moo-jin, a professor at the University of North Korean Studies.